That’s a quote from the Sound City movie. They were talking about tracking at Sound City Studios, and how most of the tracking was done by the entire band, playing together, in a big ol’ room. On paper, Sound City shouldn’t have amounted to much of anything. Yes, they had a big, awesome Neve console, but it was a far stretch from the swanky, comfortable studios we’re used to seeing. And yet, it had a vibe to it. Musicians would come in, set up, camp out, and make some killer music. Now, I’m not gonna say that the huge Neve console didn’t play a role in the success and great sound of the albums that came out of Sound City, but a console can’t create FEEL. And FEEL seems to be one of the most important (and most elusive) elements of a good album. As Lars said, you can study things like engineering and techniques from books or tutorials, but “feel” comes from musicians, and your job is to figure out how to bring out that feel in the musicians you work with. Recording parts one at a time certainly isn’t wrong, but you should try experimenting with different ways to record music. Maybe you track the vocal and guitar at the same time, because that yields the best performance. Yes, you might sacrifice quality a bit (since you have to deal with bleed between mics), but if you get a much better “feel,” than you made the right choice. 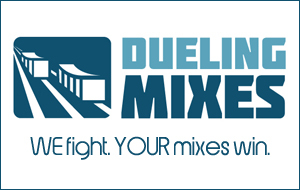 For example, listen to this month’s tracks over at Dueling Mixes. They were all tracked together (at least the instrument were, possibly the vocals, too), and they sound great. And yes, they have a nice “feel” to them.